This autumn join us on an adventure and share our passion for great flavour as we explore seasonal mushrooms. 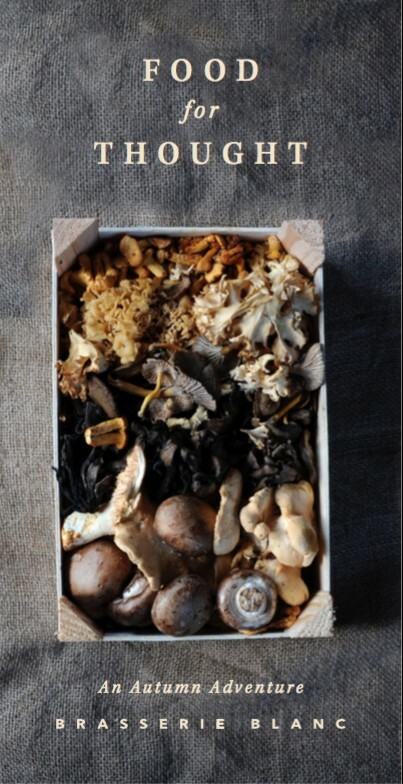 The Majestic Mushroom, one of our most versatile ingredients, from the delicate oyster to the mighty Portabello. Make a note of our tips to help you make the most of your seasonal mushrooms, both wild and woodland. You can also pick up one of our beautiful limited Food for Thought cards, featuring gorgeous food photography by the very talented Jill Mead, from one of our brasseries. Sauté a selection of mushrooms with olive oil, garlic, a pinch of tarragon and a dash of white wine. Stir into cooked pasta. Top with grated Grana Padano and chopped parsley. Caramelise your mushrooms in butter and seasoning in an oven-proof frying pan or tarte tatin dish. Cover with a thin layer of puff passtry and pop in the oven until risen, crisp and golden. Invert the dish carefully on to a plate, serve with green salad. Marinate mushrooms in olive oil, lemon zest, basil, garlic and oregano, and serve on toasted sourdough. Perfect for a light lunch or delicious canapé. Our autumn menu features Boudin Blanc with woodland mushrooms, steamed leeks & wild mushroom & sherry cream sauce. Pop in to try it for yourself.